Suns InterchangeMatthew Warnock off due to an injury. Suns InterchangeJoel Wilkinson off due to an injury. GOAL POWERA chain of handballs inside attacking 50 ends with Broadbent who handballs over the top to Wingard and he finishes it off to kick the goal. BEHIND SUNSHarbrow with a set shot from 40 metres out that drifts out to the left to get the scoring underway. Welcome to the Gold Coast for Port Adelaide's visit. The Power come to the Gold Coast with an unbeaten record in 2013. We are off and underway at the Gold Coast. The teams have been announced with Bennell a late withdrawal. He is replaced by Russell who will start as the nominated substitute. Gray will be Port Adelaide's substitute. Welcome to Metricon Stadium for the Gold Coast Suns v Port Adelaide Round 4 clash. 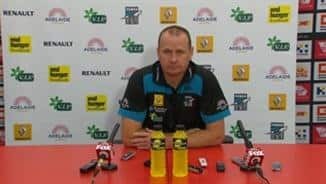 KEN HINKLEY'S dream start to AFL coaching continued on Saturday night as Port Adelaide made it four straight wins with a 38-point thumping of Gold Coast at Metricon Stadium. After an even first quarter, the Power blew the game open with nine goals to one in the second term and were never troubled in winning 16.8 (104) to 9.12 (66). It was a successful return to the Gold Coast for Hinkley, who was Guy McKenna's assistant for the past three years. Port Adelaide now sits alongside Essendon on top of the competition and hosts West Coast at AAMI Stadium next Saturday. The Power worked relentlessly both with and without the ball, suffocating the Suns (1-3) in close, and spreading hard when they won the ball. "It was a good result for us," Hinkley said. "Clearly we faded in the last quarter when we ran out of energy a bit. (But) to come away with a six-goal win, travelling, you'd always be happy enough to take it." Hamish Hartlett was outstanding, racking up 29 quality disposals and kicking all three of his goals in the match-turning second quarter. Kane Cornes was also influential, turning his night around after a horrid first quarter. He started alongside Gary Ablett and watched the Suns' skipper notch 15 disposals for the term, but was then set free by Hinkley. He finished with 35 touches, an astonishing 33 of them uncontested. As Cornes ran free, Dom Cassisi switched over to Ablett - a move Hinkley described as "fairly significant" - and kept him to 19 touches for the final three terms. It was a complete team effort built on power running and desperation without the ball. 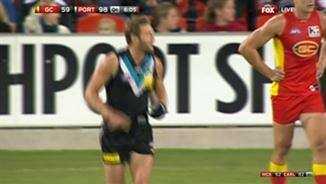 Jay Schulz (four goals) and Justin Westhoff (three) were a handful for the Suns' defence. Schulz took a spectacular mark in the third quarter, jumping on to the shoulders of Sam Day to pull down a screamer. The Power's pressure flustered a Gold Coast team that had been super competitive in the opening three rounds but got a big reality check on its home turf. Whether it was Hinkley's intimate knowledge of the Suns or just his team's superior work-rate, it was largely one-way traffic. 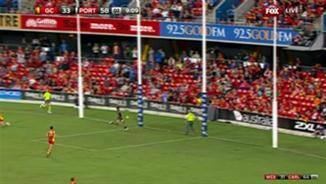 They literally ran rings around Gold Coast in the second quarter. Jake Neade's sublime snap typified the dominance as he tracked down a loose ball, sold Greg Broughton some candy, then calmly walked into an open goal as the Suns defender flew past him. 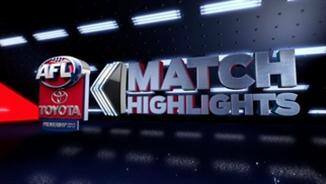 It was a poor night for the Suns, who entered the match without Harley Bennell (hamstring) and lost Joel Wilkinson (ankle) and Matthew Warnock (shoulder) with injury. McKenna was at a loss to explain the second quarter disaster. "We started really well. It's hard to explain, we’ve sorted out our starts and we outscored them in the second half, (but) to be outscored 9.3, it is unlike the Gold Coast, even in the first two seasons," he said. 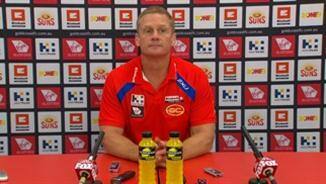 "I certainly didn’t smell that at quarter time. I thought the boys' efforts and intensity in this game and the season has been really good. "You back off one step, it doesn’t matter who you’re playing against, you get exposed, and we got exposed." Gold Coast: Luke Russell was subbed on for Joel Wilkinson (ankle) in the second quarter. 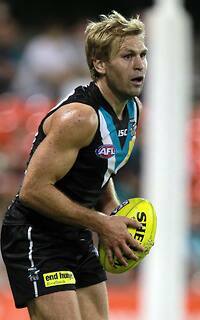 Port Adelaide: Robbie Gray was subbed on for Jake Neade in the third quarter.